Hello all, I have a bad case of "looking at this too long eyes" and need some pro criticism. 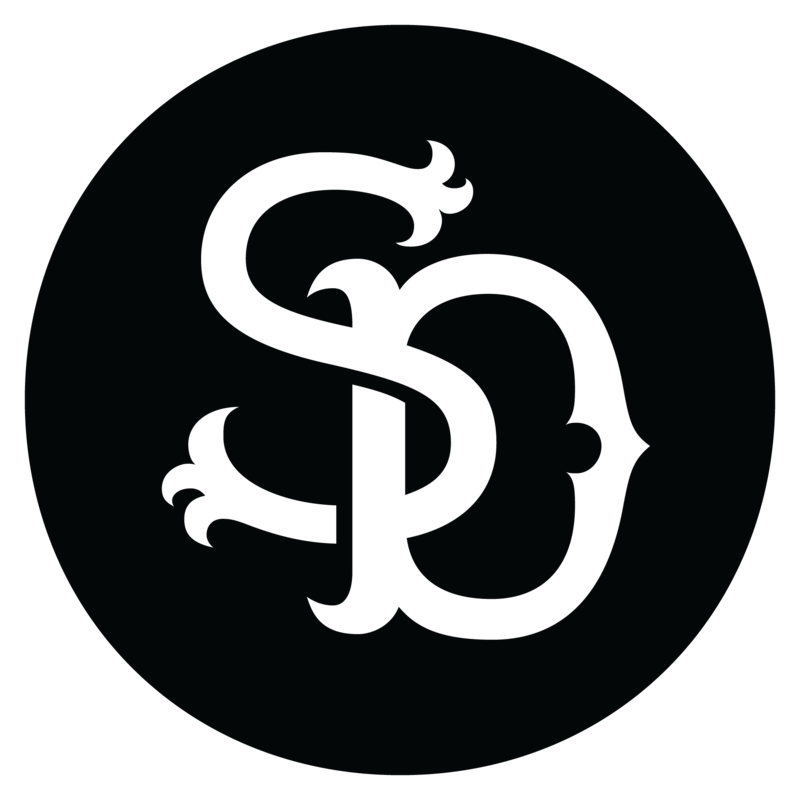 This is my personal monogram/freelance logo. I feel like thickness of the /D flared serifs are conflicting with the triple flared serifs of the /S... Not sure what the best solution is. The vertical stroke of D looks too heavy to me. And the spine of S is too light. 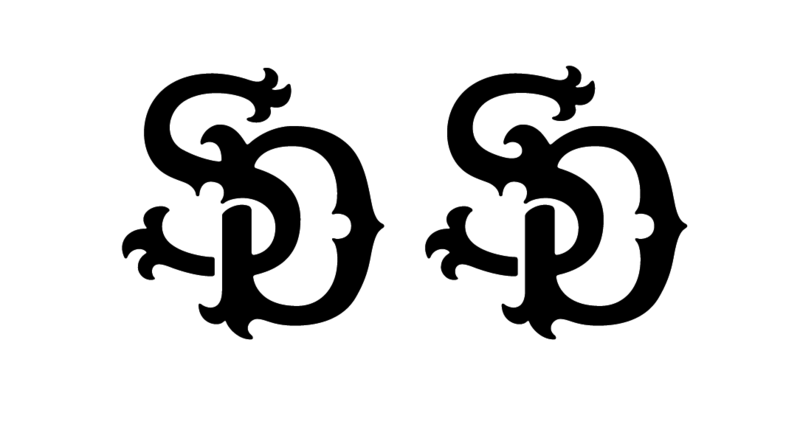 I would add another spike to the serifs of D to make it match the S. The serifs would still appear trifurcated because of the top of D is an arc. First thing first: what kind of clientele are you looking to attract? I tried the addition of spikes and it looked a little overloaded.... I'm also trying to find some references of some old monograms. I have mostly just found stock images, so I don't have the greatest frame of reference. Mostly local companies. (London & Toronto, Canada) for general freelance, until I graduate and get a job at an agency or design firm, I will continue with side projects and freelance throughout, I just want my personal monogram to shine for my portfolio and social media ect. I think the stroke weight differences makes it interesting. It seems like you've having trouble with the triple spike ends. Try splitting then into double spikes, then creating the 3rd spike as a separate overlapping object. That way you can get them to "flow" out from them stem more gracefully as they do on the D. When designing these types of curves on paper, I find it easier because I can turn the page around at different angles. On the screen it helps to rotate the design on a diagonal and rotate it back later. I'm pretty sure the awkwardness at the top of the S is due to rectilinear working conditions. I think it's pretty but it's giving off a certain niche heraldic vibe. Something clever but more generic in style might work better for appealing to a broad base. Like a "D" with an "S" as its internal negative space. Or an "S" where the bottom-right is a "D". Something that will make people see you have control over how shapes talk, without committing to a particular style. 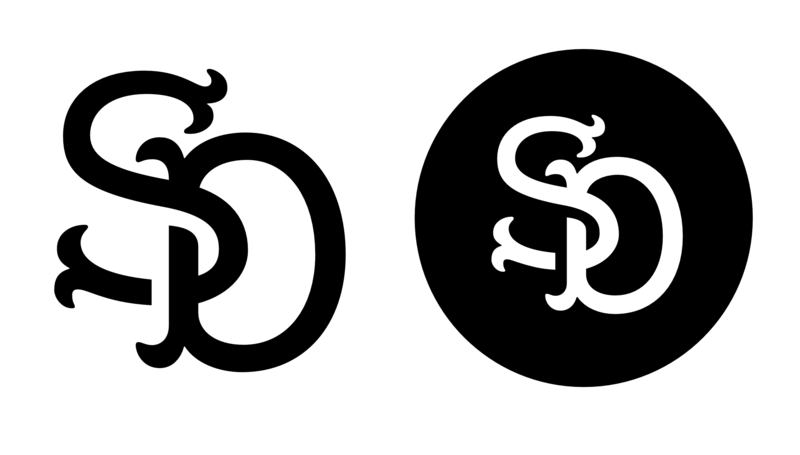 Or if you really like that lion's tail terminal, maybe use it only on one end of the "S" and make the other end plain. As in: "I can do both." Which might make it rich enough to not need a "D". Might have to outsource a bit! For what it's worth, I get a major league baseball vibe from this (like if the Mets moved to San Diego). 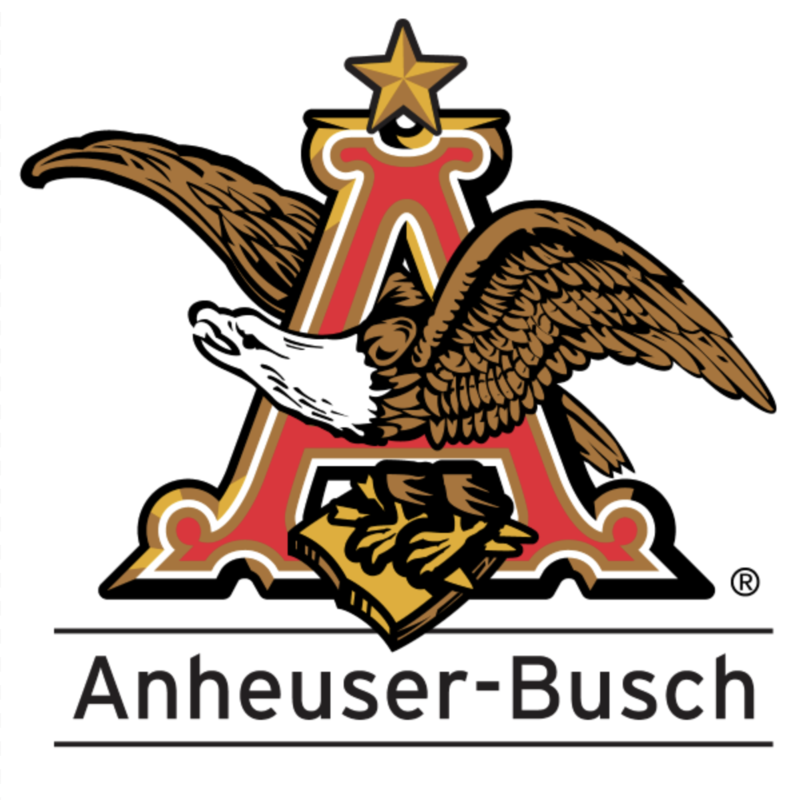 @Craig Eliason I love baseball monograms—and beer, like Anheuser Busch there's something about that historical wood press monogram look that just gives me the most joy. While I love Lapsang Souchong, and orange vintage BMWs. But I know I'm not my prospective clients... Although self-enjoyment is integral to any creative act, I believe that in Design –unlike in Art– this must come in spite of oneself, as opposed to explicitly. 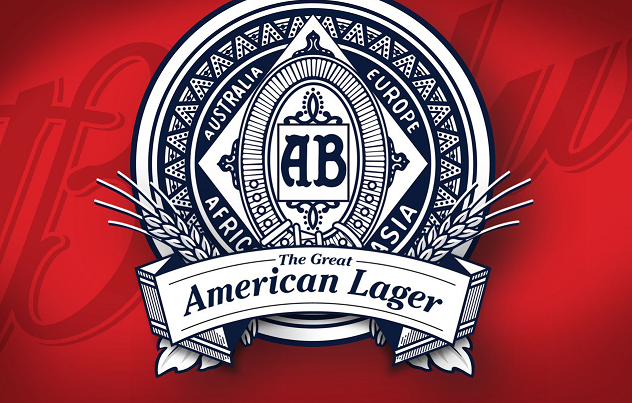 Your love of baseball and beer should naturally manifest itself in your work, subtly. Not as a guard at the front door. And I think a good agency or design firm hires people who put their clients first. I want something that reflects my own style, that can express my work—you know?.. It's certainly a tricky balance, and I'm no fan of simplicity. I guess it depends how much of your work looks like (or will look like) what. I think the bifurcated/tuscan serif evolved into something that's trifurcated looks unnatural? 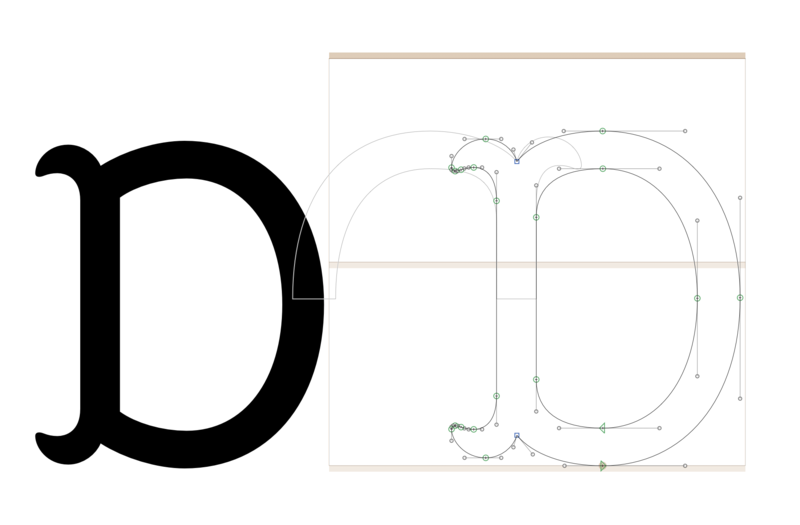 The serif on the D looks super heavy, so does the stem like like @James Puckett mentioned. The bowl on the D could use more curvature, right about now it looks like a rounded rectangle. Aside from that there are lumpy areas on the S's contour that needs a cleanup. Thanks, I agree, the trifurcated idea was some-what arbitrary. I think most references I have seen that follow this style are bifurcated... Here is what I'm working with now: I still need to work on the spine and the bowl of the D but what do you guys think is working best? 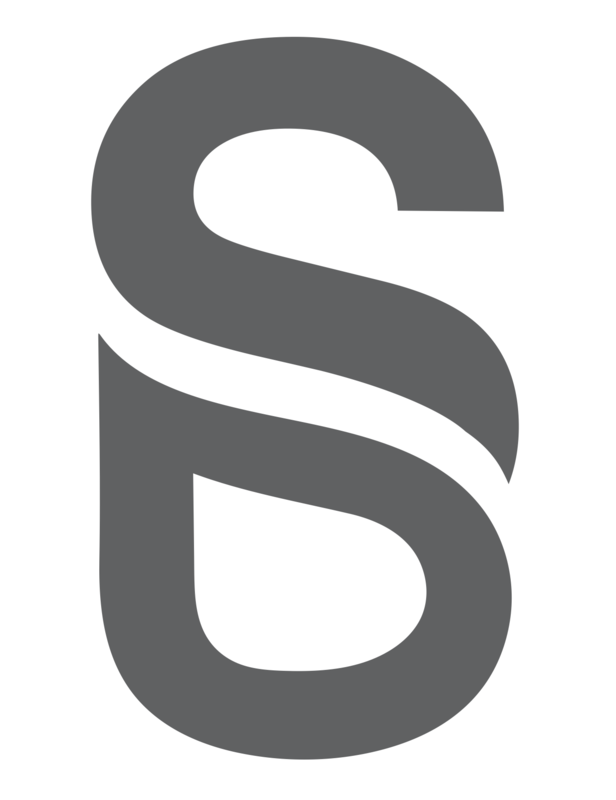 I'm also going to make the top of the S a smoother transition, it curves too aggressively. 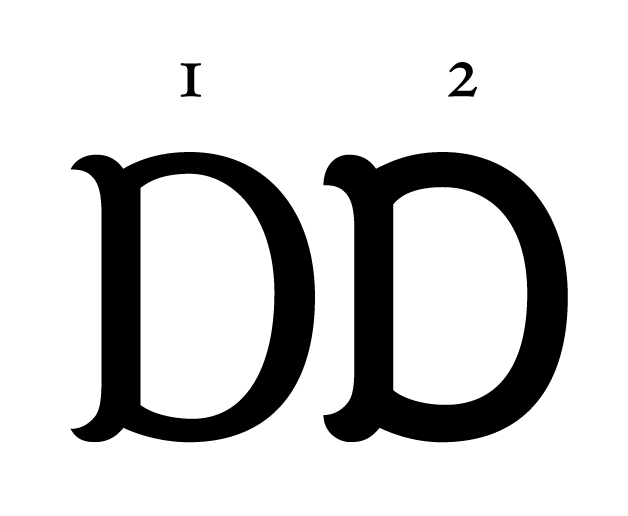 @Simon Dunford the serifs are the root cause for why D looks weird both at it's stem and the bowl. I've drawn up a quick example of how they should split in this [link], if they're split too far from the center then it messes up the overall letter, in your case the center is almost touching the other end of the stem, that's way too far. The green dotted guide is buttsmack in the center, this tells you where it starts to split. The pink overlay is used as a guide to see the right serifs, but also to see the path on which the serif curves outward. For stems attached to a bowl or a lobe or an arm like say B, E, P, D, R, optically you want to move the green dotted line atleast 20% away from the center. Once you know where it splits, you can determine the weight, contrast and so on for the bowl or arm or lobe by simply just following the path the serif points to. The weight of the serif gives you clues to all that info. All the legwork is done by how those serifs are split initially. I dunno if that made total sense but that's the best way I can put it. That makes sense, I understand. The only drawback I see is that the junctions (? I think that's the term) are now a point instead of rounded, perhaps once I get the placement correct I can round the corners. I'll send some screenshots of comparisons when I iron this out — give me a sec. Even if I said the trifurcated serifs looked unnatural, there's no reason for you to remove it provided you can get it to work and I think one could. If anything the whole point of lettering is to design something that's not readily available in a typeface or lettering. Trifurcated serifs are rare as far as I know, so it's an area you can explore and have something that looks original n different. Bifurcated/tuscan serifs are all over the place, nothing new, it's been done to death so if I were you I'd try hard to get trifurcated serifs to work and if all else fails your fallback is a bifurcated serif. Your current draft looks better than the first iteration although there's something about the serifs being too stretched out. 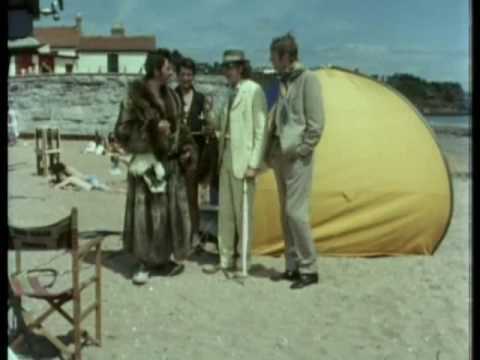 As for the junction you mentioned, I think I know what you mean. You mean within the counter where the stem meets the bowl? If so yeah some people tend to round it off and some don't. I for one think it should level with the height of the bi/trifurcated serifs so it looks even, as in your stroke width would be similar to that of the serif, this achieves the same height and weight if that makes sense. 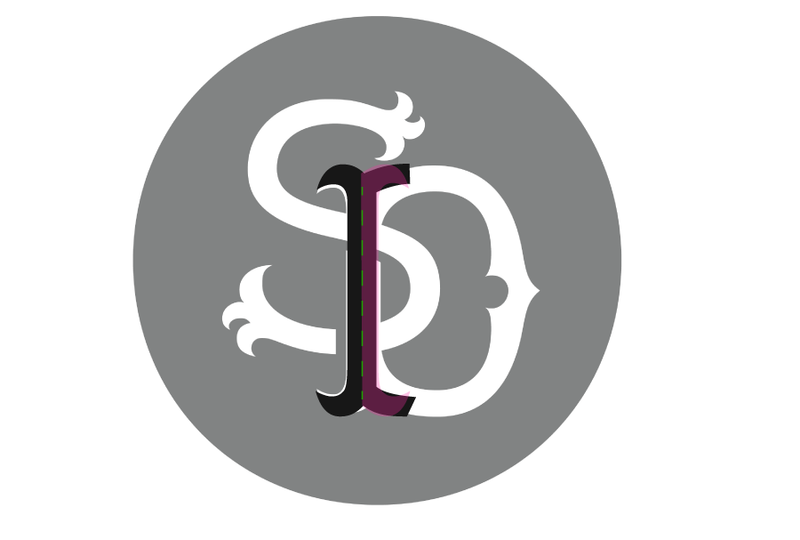 On a different note, understand that the D is supposed to overlap the S as you had intended in your original draft. So my theory is in order to see if the D works with the S you're going to have to draw the S along side the D even in your rough drafts. The area where the D and S overlap is tricky given D has serifs, so the area may look heavy in black if it's not done right. So you'd wanna keep that in mind for your next sketches or whatever incorporating both the S and D to see how it fits. To illustrate what I was trying to say last nite, I drew up an [example]. Excuse the shaky hands, will take a few jars of coffee to kill last nite's buzz. 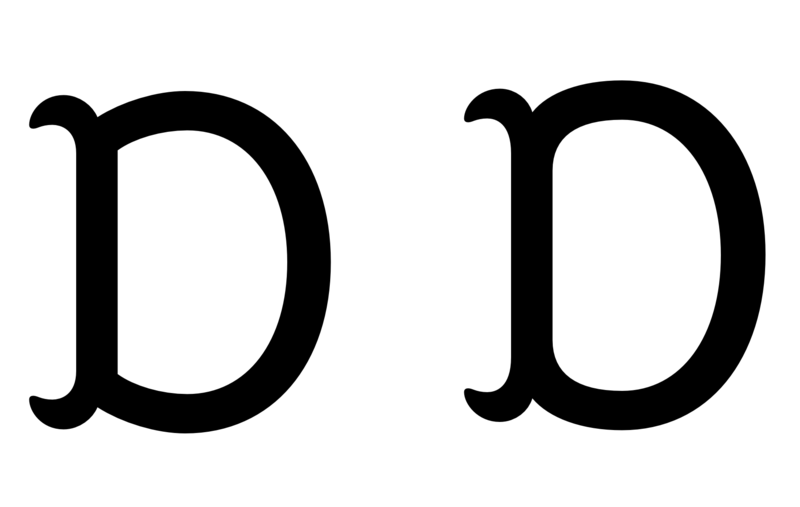 In the example, 1 is basically to address the heaviness from overlapping by distributing S' weight and also you get to keep the trifurcated serifs as intended in your original draft. It's one way to draw it but there's prolly more but I'm gonna leave that up to you to see what's fitting. 2(abcd) is to address the junction. The horiztonal guide tells you the width of the stroke from the serif. I've noticed some typefaces & lettering artwork don't follow the width based on the serif and instead have drawn it like your version, I feel if you do that the bowl can appear like it's floating about, also the serifs end up looking detached when in theory you want the serif making up the letter really. Top serif of S gets a touch too close to the D maybe. That upper counter of S could be bigger. The circle frame doesn't seem to fit the mood. Maybe make it oval? Top serif of S gets a touch too close to the D maybe. @Simon Dunford I think this works best on a black bg and the cutoffs are nice. However if you're gonna use the same logo for both a B&W bg, then you'd wanna consider doing two versions of it given white text on black can appear thicker. Your current iteration could use a cleanup around the spine though since it's wonky. Aside from that I still think the serifs look detached like it isn't making up the stroke. The serif dictates the contrast, here's a rough [example], in this 1 is based on a higher contrast because the serifs are thinner, 2 is like yours with mild to no contrast. Both cases the serif decides how much contrast needs to be there so it looks less detached from the letter. My suggestion is to go by the serif. Try it on an escutcheon.